Blue is one of those timeless colors that never really go out of style. Sure, certain shades lose a bit of their popularity every now and then, but you never see an entire fashion or decorating season completely void of blue. Blue has long been considered a color that “feels quiet” and helps to cool you down, both physically and mentally, making it perfect for bedrooms (and porch ceilings). It is a favorite color for many, and it is funny to learn that the ancient Greeks thought of it as ugly and barbaric (source: “Blue: The History of a Color” by Michel Pastoureau). There are tons of hues of blue, many with wonderful names that all conjure up different images. Just look at these: azure, robin’s egg, aqua, cornflower, cerulean, Persian, royal. People discovered how to dye fabric blue thousands of years ago, using the leaves from a shrub called woad (and later used indigo). In Europe, woad was the only source of blue dye up until the Middle Ages, when indigo slowly made its way through the continent. It was first used by artists, and it was not until the 1500s that people started to use it to dye fabrics. Lately, woad has been making a comeback, and a few companies in France and the UK are offering products dyed exclusively with woad. We’re starting out with a classic, both when it comes to color and imagery, in very subdued hues. 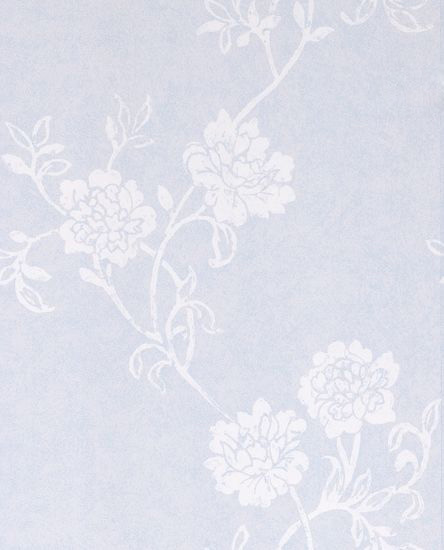 This one comes from Graham & Brown, and I love this pale, pale blue with the pretty white flowers, perfect for a bedroom in a summer cottage, or as a focal wall in a bedroom. It’s eco-friendly too – the paper comes from managed timber sources and the inks are water-based and totally non-toxic. And now, something completely different. 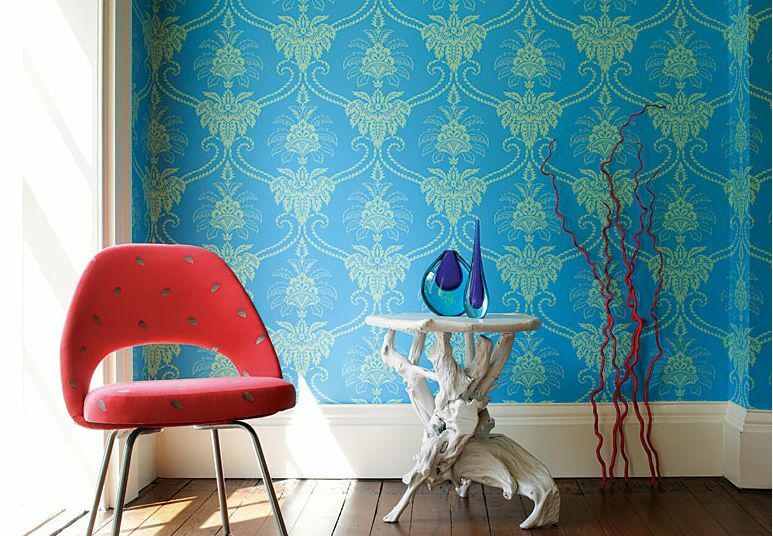 This fun wallpaper comes from British company nono’s “New Oriental” collection and definitely makes it into the unique category. 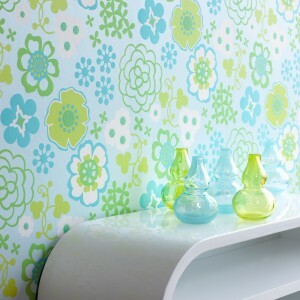 All their designs are bold, unusual and fun, and it’s no surprise that they are a rising star in the world of wallpaper. This blue flower wallpaper from Swedish company Intrade is not for the faint of heart… I think it would work best in a totally mod home, vacation cottage, or in a girl’s room. It’s fun and colorful though, and definitely stands out. 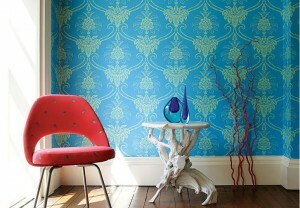 Another fabulous wallpaper from England, this one by Anna French. Her collections are always exciting, with color schemes ranging from the discreet and subdued to the bold and daring. 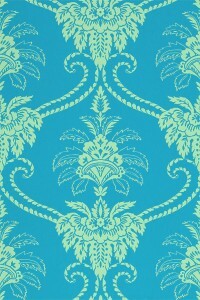 This vibrant blue damask wallpaper from her “Wild Flora” collection falls somewhere in between, I think. (For more from Anna French, check out my green wallpaper post). A very different look from the previous flower wallpaper, this one comes from Marie Claire (yes, the same Marie Claire as the magazine), and I had to include it because I love what they’ve done here with the “in your face” focal wall and the three round cutouts as wall decor pieces on the other. Fabulous. 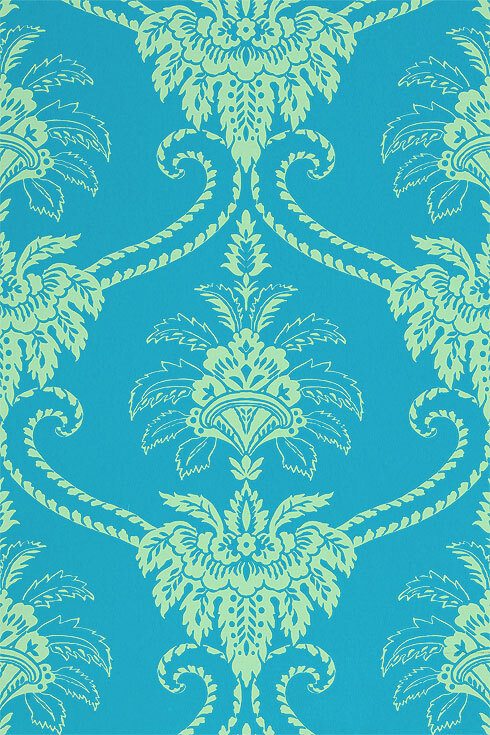 Also check out the blue glowing Nature Ray Charles wallpaper in my Unusual Wallpaper Designs post and the adorable dog wallpaper in my post about dachshunds.